We might consider two reasons for our liturgical year’s providing separate feasts for the apostles rather than a single feast to celebrate their memory. First, many of the apostles are associated with a ministry to a particular place — for example, James (the Greater) to Spain, Thomas to India, Jude to Syria and Persia. At some point the Church embraced the local traditions and invited all Catholics to participate in celebrations to honor the individual apostles. Second, the Church tends to expand, rather than diminish, opportunities for liturgical celebration. Thus, we acknowledge groups, such as the North American Martyrs (Oct. 19), who worked and died together, and Sts. Peter and Paul (June 29), who share an undeniable link in building up the early Church. However, allowing us to celebrate feasts dedicated to the individual apostles enables us to reflect on their distinctive, personal merits, and to discern ways in which we might incorporate an apostle’s strengths (or build on his weaknesses) as we strive to live out our own apostolic witness. Because the first Eucharistic prayer names each of the apostles, we have an opportunity to celebrate a feast in their collective honor whenever the celebrant uses that prayer at Mass. Each year on Aug. 5 the Church liturgical calendar commemorates the dedication of St. Mary Major (in Italian, Santa Maria Maggiore), one of the five great ancient basilicas in Rome…. Each year on Aug. 5 the Church liturgical calendar commemorates the dedication of St. Mary Major (in Italian, Santa Maria Maggiore), one of the five great ancient basilicas in Rome. Why would that event be a feast day for the universal Church? What is our connection to the dedication of a building that took place in Italy over 1,500 years ago? The history of this church is rooted in the role of Mary as the Mother of God. Its story begins with a fourth-century legend. According to this legend, living in Rome around the year A.D. 350 was a wealthy and childless couple who, upon their death, wanted their earthly possessions used in a way that would honor the Virgin Mother. They prayed earnestly for divine guidance. Mary appeared to the husband in a dream, requesting that a church be built for her on a site where snow would fall in midsummer. The couple quickly reported Mary’s request to Pope Liberius (reigned 352-366), who claimed to have had a similar dream. On Aug. 5, at the height of the summer heat, snow miraculously fell on an area of Rome called Esquiline Hill, defining the floor plan of the church. Here, the legend concludes, the first Christian church in honor of the Virgin Mary was built. It was called the Liberian Basilica after Pope Liberius. Archaeological and other evidence suggests that the legend has no historical basis. No mention whatsoever is made of the story until several hundred years later; even the dedicatory inscription of St. Sixtus III, placed on the church in the fifth century, says nothing about it. Nevertheless, this basilica, rebuilt and magnificently adorned over the centuries, has been a rallying point for popes and laypeople, for Romans and pilgrims alike, to venerate the maternity and life of the Blessed Mother. Extensive reconstruction and expansion of the original basilica took place following the ecumenical Council of Ephesus held in 431. That assembly was called specifically to settle a controversy regarding Mary’s title as the Mother of God. Nestorius, who had become the patriarch (archbishop) of Constantinople in 428, had used his prominent position to preach the heretical doctrine that Mary was only the Mother of Christ (Christotokos), not the Mother of God (Theotokos; literally, “God-bearer”). He and others claimed that there were two separate persons, one human and one divine, within Jesus Christ; and that the human person born of Mary, who was crucified, died, buried and resurrected was not divine. Consequently, Nestorius and his followers argued that Mary could not be called “Mother of God,” because she was the mother only of the human person in Jesus, not the divine Person. Leading the opposition to the Nestorian heresy was St. Cyril, patriarch of Alexandria, Egypt. Cyril helped to clarify the Church’s understanding that Jesus is not two persons. Rather, he was born one Person in whom are united two natures, one fully human and one fully divine. That one Person is the divine, eternal Son of God. When Mary gave birth to the Word made flesh, she was giving birth to that one divine Person in two natures. Accordingly, Mary is rightfully called the Mother of God. This controversy was brought to a head at the council in Ephesus during June and July 431. Nearly 200 bishops gathered there. They deposed Nestorius and declared that Mary is truly the Mother of God. The decision of the council was widely acclaimed and increased the veneration of Mary throughout Christendom. In her Magnificat, Mary had said, “All generations will call me blessed” (Lk 1:48, RSV). Now, and for all eternity, not only would she be called blessed, but she would be duly known by the name of highest dignity, Mother of God. Though the Council of Ephesus officially condemned Nestorius and the heresy he promoted, the controversy continued to fester. Accordingly, Pope St. Sixtus III (d. 440), who became pope one year after the council ended, immediately began to rebuild the Liberian Basilica. Upon completion of the renovations, he dedicated it to Mary, the Mother of God. This action by Pope Sixtus further affirmed the Holy See’s approval of the council’s dogmatic declaration in Ephesus. It also linked forever this Roman basilica to Our Lady’s divine motherhood. For awhile the basilica was known as St. Mary of the Crib after it obtained a relic of the Holy Crib, believed to be the one in which Jesus was laid at His nativity. This relic was carried to Rome by Christian refugees from the Holy Land fleeing the Muslim invasion of the seventh century. The basilica still hosts a procession of the Holy Crib every year on Christmas Day. Upon his election in 1566, Pope St. Pius V had the responsibility to implement and enforce the decisions of the Council of Trent (1545-1563), which included condemnation of Protestant errors and affirmation of Mary as the Mother of God. In response to the Protestant reformation, renewed and increased Marian devotion began to spread among the Catholic faithful. Seeking to perpetuate this renewal, Pope Pius introduced the feast of the Dedication of the Church of Our Lady of the Snow onto the Church liturgical calendar, which further emphasized and continually honored the divine motherhood of Mary. While such a feast day had long been observed locally in Rome, it was not part of the universal calendar until 1568. To commemorate this event, each year on Aug. 5 white rose petals are dropped from the dome during the festal Mass. The basilica was fully restored and renovated in the 18th century. Its present façade and most of its interior decorations date from this period. Even so, it still contains elements from its ancient beginnings, including a number of marble columns and several fifth-century mosaics. It also features a 240-foot medieval bell tower, the highest in Rome. Simultaneously, the feast was identified as an optional memorial, meaning the celebration is not obligatory but at the discretion of the priest offering Mass. The feast day is always proclaimed in Rome. Since St. Mary Major is a patriarchal basilica, it contains a papal altar used only by the pope himself or a priest to whom he has given special permission. Customarily, the Pope celebrates Mass here each year on the feast of the Assumption of Mary (Aug. 15). Some relics of the True Cross are preserved in the church, housed in a 14th-century cross-shaped reliquary. An urn on the altar contains the relics of St. Matthew and other martyrs of ancient times. St. Jerome (c. 341-420), a Doctor of the Church who first translated the entire Bible into Latin, is buried here. Several popes are buried here as well. The basilica is also home to the celebrated icon of the Blessed Virgin known as Salus Populi Romani (“Health of the Roman People”). This name comes from a miracle in which the icon helped shield the city from the approach of the plague. Legend claims that it was painted from life by St. Luke the Evangelist, but most scholars agree that it dates from the 13th century. A museum beneath the church features ancient Roman ruins discovered there: two wells, a section of a Roman road, a mosaic pavement, and a series of arches and passageways cut into the bedrock. The feast of the Dedication of St. Mary Major is not intended simply to call our attention to a legend or dedication of a beautiful church. Rather, it reminds us that Catholic Christians throughout history have believed and continue to believe that the young Jewish girl named Mary, chosen among all women to be the fleshly tabernacle of Jesus, is indeed the Mother of God. This belief is an established truth, a dogma of the Catholic faith. St. Mary Major Basilica stands as an earthly symbol of that important reality. On the last Sunday of the liturgical year, Catholics celebrate the Solemnity of Christ the King. A relative newcomer to the Church calendar — established in the 20th century — this feast is designed to give special recognition to the dominion Christ our Lord has over all aspects of our lives. But why and how did it come about? And why is it so important today? When Cardinal Ambrogio Achille Ratti was elected pope and took the name Pope Pius XI, much of the world was in shambles. The year was 1922, and while the bloodletting of World War I (1914-1918) had ended, widespread peace and tranquility were not evident. The war to end all wars had been especially devastating to England and the countries of continental Europe. Additionally, the overthrow of the Romanov tsars by the Russian Revolution had created great upheaval in Russia and brought immense suffering. Governments were in economic chaos, unemployment was rampant and people in many places were literally starving to death. The stability of the old social and political orders that had embraced royal houses and crowned heads of state were crumbling. The victorious warring powers sought severe penalties and unreasonable reparations from the vanquished Germans through the Treaty of Versailles. In their distress, people clung to anyone who offered them hope, offered some kind of direction out of the chaos and promised to put food on their tables. They gravitated to the emerging dictators, and as they did they often sought to be self-sufficient to the exclusion of God from their everyday lives. Many considered the basics of morality and the teachings of the Church to be out of date, no longer relevant in 20th-century society. Modern thinking allowed that, at most, Christ might be king in the private life of the individual, but certainly not in the public world. Some political regimes advocated the banishment of Jesus altogether, not only from society, but from the family as well. As nations were reborn and governments restructured, their foundations, policies and laws were often being fashioned without regard to Christian principles. In all these developments, the new Pope Pius XI saw that people were denying Christ in favor of a lifestyle dominated by secularism, material advantage and false hope created by the tyrants. He realized that he had to ad- dress the political and economic forces that were crowding out the kingship of Jesus. As a start, he dedicated his reign as pope to “The Peace of Christ in the Kingdom of Christ” ( Pax Christi in Regno Christi ). In 1925, the Church celebrated a jubilee year in honor of the 1,600th anniversary of the Council of Nicaea. The council fathers taking part in that ancient gathering in A.D. 325 had affirmed the full divinity of Jesus Christ as God the Son, one in being with God the Father. Their pronouncement became a creed that was later expanded into what we now call the Nicene Creed, which we still profess at Mass every Sunday. 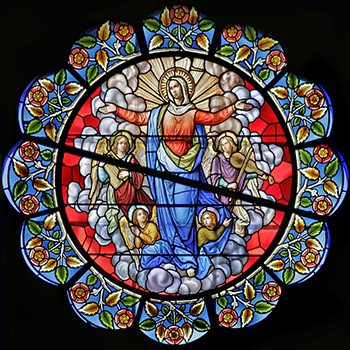 Throughout the anniversary year, Pope Pius constantly emphasized the kingship of Christ as declared in the Creed: “His kingdom will have no end.” He stressed that theme throughout the year as it repeatedly appeared in the Church’s celebrations of the Annunciation, the Epiphany, the Transfiguration and the Ascension. As part of the Holy Year, which was afforded great attention and pomp by the Vatican, hundreds of thousands of pilgrims flocked to Rome, demonstrating great fervor for their faith. On Dec. 11 of the jubilee year, and in order to acknowledge perpetually the supremacy of Jesus Christ over all men, nations and earthly allegiances, the pope issued the encyclical Quas Primas, which added the feast of “Our Lord Jesus Christ the King” to the annual Church liturgical calendar. Some at the time argued that such a celebration was unnecessary because the ancient feast of the Epiphany already acknowledged Christ as King. But more than 340 religious leaders, including cardinals and bishops, had called for the new celebration, and the pope was glad to grant their request. The encyclical provided for the feast of Christ the King to be held each year on the last Sunday of October. This date, a week before All Saints’ Day and four weeks before Advent, was carefully chosen: It reminded the people that Jesus Christ is not only King of this world, reigning among nations today; He is also the eternal King, glorified by the saints in heaven, who will one day come to judge all humankind. In his encyclical, the pope noted that the continuing disorder of that era, what he called “the plague of society,” had long been festering and was the result of nations rejecting Christ. Later in the encyclical the pontiff pointedly reminded national governments, “Christ, who has been cast out of public life, despised, neglected and ignored, will most severely avenge these insults; for His kingly dignity demands that the State should take account of the commandments of God and of Christian principles, both in making laws and in administering justice, and also in providing for the young a sound moral education” (No. 32). The pope instructed the faithful to use this annual celebration as a time to consecrate themselves, or renew their consecration to, the Sacred Heart of Jesus, explicitly tying the celebration to devotion to the Sacred Heart and to the living Christ in the Eucharist. He also called for Catholics to make reparations for the widespread atheism being practiced in many countries. Today, peace still eludes us; social, political and economic orders are shaking; and the nations continue in many ways to reject the light of the Gospel. We can be grateful, then, for the chance to celebrate each year the Solemnity of Christ the King — for the world needs now, more than ever, our witness to His rule over all things. The rebellion of individuals and states against the authority of Christ has produced deplorable consequences … the seeds of discord sown far and wide; those bitter enmities and rivalries between nations, which still hinder much the cause of peace; that insatiable greed which is so often hidden under a pretense of public spirit and patriotism, and gives rise to so many private quarrels; a blind and immoderate selfishness, making men seek nothing but their own comfort and advantage, and measure everything by these; no peace in the home, because men have forgotten or neglect their duty; the unity and stability of the family undermined; society, in a word, shaken to its foundations and on the way to ruin. We firmly hope, however, that the feast of the Kingship of Christ, which in the future will be yearly observed, may hasten the return of society to our loving Savior. But in what does this “power” of Jesus Christ the King consist? It is not the power of the kings or the great people of this world; it is the divine power to give eternal life, to liberate from evil, to defeat the dominion of death. It is the power of Love that can draw good from evil, that can melt a hardened heart, bring peace amid the harshest conflict and kindle hope in the thickest darkness. This Kingdom of Grace is never imposed and always respects our freedom. Christ came “to bear witness to the truth” (Jn 18: 37), as he declared to Pilate: whoever accepts his witness serves beneath his “banner.” . . . Every conscience, therefore, must make a choice. Who do I want to follow? God or the Evil One? The truth or falsehood? Choosing Christ does not guarantee success according to the world’s criteria but assures the peace and joy that he alone can give us. This is demonstrated, in every epoch, by the experience of numerous men and women who, in Christ’s name, in the name of truth and justice, were able to oppose the enticements of earthly powers with their different masks, to the point that they sealed their fidelity with martyrdom. Comments Off on Ascension or Assumption? After His resurrection Jesus spent 40 days with His disciples. In that time His glorified resurrection body was veiled under the ordinary appearance of humanity. After His final words to His disciples (see Acts 1:7-8), the New Testament reports, “as they were looking on, he was lifted up, and a cloud took him out of their sight” (Acts 1:9). Men in white garments then reported that Jesus had been taken to heaven. This is His glorious ascension. By use of the term “Assumption” we designate the entrance of the Blessed Virgin into glory. Here is the Second Vatican Council’s summary of this event in the Dogmatic Constitution on the Church: “The Immaculate Virgin, preserved free from all guilt of original sin, on the completion of her earthly sojourn, was taken up body and soul into heavenly glory, and exalted by the Lord as Queen of the universe, that she might be the more fully conformed to her Son, the Lord of lords and the conqueror of sin and death” (No. 59). Each September the Church celebrates the feast of the Exaltation of the Holy Cross on Sept. 14, and the memorial of Our Lady of Sorrows follows on Sept. 15. The pairing of these celebrations, even in their different levels on the liturgical and sanctoral calendars, properly guides us in our levels of devotion and love of our Savior and Our Lady. He is our Divine Redeemer, to be worshiped and adored; she is His first disciple and our example. Both of these celebrations have a long history and are worthy of meditation. The feast of the Triumph of the Cross was observed in Rome in the late seventh century to commemorate the recovery of the Holy Cross by Byzantine Emperor Heraclius in 629. St. Helena, Emperor Constantine’s mother, had found the True Cross in Jerusalem in the fourth century, but the Persians had captured it and only returned it after Heraclius defeated the Persian king Khosrau II. The emperor returned it to Jerusalem, and this feast recalls that event. As he approached the holy city, dressed in fine robes and festooned with jewels, the emperor found himself unable to process further until Zacharias, Patriarch of Jerusalem, told Heraclius to humble himself by removing his imperial regalia and proceeding as a barefoot pilgrim. But on a deeper level, of course, the feast recalls Jesus’ triumph over death and the fulfillment of His great statement, “When I am lifted up from the earth, I will draw everyone to myself” (Jn 12:32, which serves as the Communion Antiphon on this feast). The liturgy of the Mass for this feast includes both triumph and sorrow in the readings and prayers, since Jesus both suffers His passion and defeats sin and death. From the Book of Numbers (21:4b-9), the first reading recalls the story of Moses and the bronze Seraph, raised on a pole — when the people of Israel, who had been grumbling against God for their sufferings, looked up to the serpent, they were healed of the serpent bites God had sent to afflict them. “But they flattered him with their mouths / and lied to him with their tongues . . .
Like the commemoration of Good Friday during Holy Week, the feast of the Exaltation of the Holy Cross reminds us of the wondrous contradiction at the heart of our faith: that we are redeemed by the suffering and the sacrifice of Jesus Christ, offered to God the Father. Sept. 15 then recalls the sorrow of Our Lady at the foot of the Cross as the fulfillment of Simeon’s prophecy at the Presentation of Jesus in the Temple: “(and you yourself a sword shall pierce) so that the thoughts of many hearts may be revealed” (Lk 2:35). The Gospel for Mass that day may be either the description of “his mother and the disciple . . . whom he loved” standing by the cross of Jesus (Jn 19:25-27) or the Presentation in the Temple (Lk 2:33-35). The sequence Stabat Mater — often sung while praying the Stations of the Cross — may be chanted after the Psalm. According to Lumen Gentium (the Second Vatican Council’s Dogmatic Constitution on the Church), “the Blessed Virgin advanced in her pilgrimage of faith, and faithfully persevered in her union with her Son unto the cross, where she stood, in keeping with the divine plan, grieving exceedingly with her only begotten Son, uniting herself with a maternal heart with His sacrifice, and lovingly consenting to the immolation of this Victim which she herself had brought forth” (No. 58). 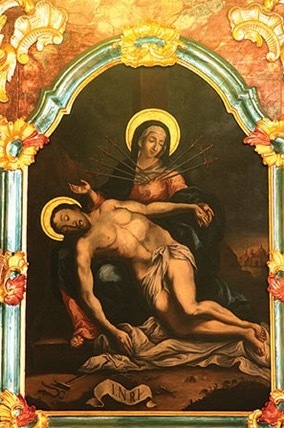 In religious art, Our Lady of Sorrows is depicted in three ways: as the Stabat Mater, standing by the cross; in the Pietà as an object of pity (most famously in Michelangelo’s sculpture, but also very movingly in Mel Gibson’s movie “The Passion of the Christ”); and as the Mater Dolorosa, Mother of Sorrows, often with seven swords (the seven sorrows) piercing her Immaculate Heart. The Stabat Mater sequence has been set to music by composers from Antonin Dvorak to Domenico Scarlatti, from Joseph Haydn to Arvo Pärt, and others, in styles ranging from Renaissance polyphony to almost operatic oratorio. Stephanie A. Mann writes from Kansas. “What a great thing it is to possess the Cross! He who possesses it possesses a treasure” (St. Andrew of Crete, Homily X on the Exaltation of the Cross, PG 97, 1020)…. The instrument of torture which, on Good Friday, manifested God’s judgment on the world, has become a source of life, pardon, mercy, a sign of reconciliation and peace. “In order to be healed from sin, gaze upon Christ crucified!” said St. Augustine (Treatise on St. John, XII, 11). By raising our eyes toward the Crucified One, we adore Him who came to take upon himself the sin of the world and to give us eternal life. And the Church invites us proudly to lift up this glorious Cross so that the world can see the full extent of the love of the Crucified One for mankind, for every man and woman. She invites us to give thanks to God because from a tree which brought death life has burst out anew. On this wood Jesus reveals to us His sovereign majesty, He reveals to us that He is exalted in glory. Yes, “Come, let us adore Him!” In our midst is He who loved us even to giving His life for us, He who invites every human being to draw near to Him with trust. This is the great mystery that Mary also entrusts to us this morning, inviting us to turn toward her Son. In fact, it is significant that, during the first apparition to Bernadette, Mary begins the encounter with the Sign of the Cross. More than a simple sign, it is an initiation into the mysteries of the faith that Bernadette receives from Mary. The Sign of the Cross is a kind of synthesis of our faith, for it tells how much God loves us; it tells us that there is a love in this world that is stronger than death, stronger than our weaknesses and sins. The power of love is stronger than the evil which threatens us. Since the year 2000, the universal Church has concluded the Octave of Easter by celebrating Divine Mercy Sunday. This great solemnity calls the faithful to rejoice in the merciful love of God as it is most profoundly manifested in the Paschal Mystery of Jesus Christ. But what exactly is the Divine Mercy? Where did this devotion to the Divine Mercy begin? Is this a new feast day in the Church? In his 1980 encyclical Dives in Misericordia (“Rich in Mercy”), Pope John Paul II writes, “Believing in [God’s] love means believing in mercy. For mercy is an indispensible dimension of love; it is as it were love’s second name and, at the same time, the specific manner in which love is revealed” (No. 7). Salvation history is rich with evidence of this truth. From the beginning, the Covenant that the Lord established with the people of Israel reflected the nature of His love. As He gives the Ten Commandments to Moses, He promises to show “mercy to thousands of those who love me and keep my commandments” (Ex 20:6, RSV). Later, again to Moses, God gives this description of himself: “The Lord, the Lord, a God merciful and gracious, slow to anger, and abounding in mercy and faithfulness, keeping merciful love for thousands” (Ex 34:6-7, RSV). As the Old Testament narratives continue, we see the people of Israel habitually turning to God in their sin and misery as a child turns to his father, trusting in his merciful forgiveness. King David sings of the Lord who is “merciful and gracious,” “slow to anger and abounding in mercy” and who does not deal with us according to our sins (see Psalms 103, 145). Even the prophets, who preach a message of destruction to Israel for its infidelity, speak also of the mercy that the Lord wishes to lavish upon it if only the people will return to Him (see Jer 3:12; Hos 14:3). “Christ confers on the whole of the Old Testament tradition about God’s mercy a definitive meaning. Not only does he speak of it … but above all he himself makes it incarnate and personifies it. He himself, in a certain sense, is mercy” (No. 2). Christ’s entire life can be seen as a testimony to the mercy of God. At His conception, Our Lady sang her great hymn of thanksgiving: “His mercy is from age to age to those who fear Him” (Lk 1:50). At the start of Christ’s public ministry, He proclaimed, “release to the captives” (Lk 4:18, RSV), and later, “blessed are the merciful, for they will be shown mercy” (Mt 5:7). In the words of His last agony, Jesus prayed, “Father, forgive them” (Lk 23:34). Indeed, the presence of Jesus Christ in the world reveals to us the face of God, who is the “Father of mercies” (2 Cor 1:3, RSV). Simply speaking, then, the “Divine Mercy” is another name for the revelation of this magnificent love of God, which culminates in the life, death and resurrection of Christ. Christians have long known and praised this abundant mercy. In this sense, devotion to the Divine Mercy is not new. Sister Mary Faustina Kowalska, born in 1905, was a cloistered nun of the Congregation of the Sisters of Our Lady of Mercy in Poland. On Feb. 22, 1931, Jesus first appeared to Sister Faustina. He was clothed in a white robe, with two rays of light emanating from His heart — one red and one white, representing the blood and water that came forth from His pierced side at His crucifixion. He requested that this image be painted with the signature, “Jesus, I trust in You,” and promised that even the most hardened sinners who would revere this image would be saved. Our Lord told Faustina of His great desire that the first Sunday after Easter be dedicated as the “Feast of Mercy,” and that this image of His mercy be known and venerated by the whole world. Our Lord appeared to Sister Faustina — whom He called His “apostle of mercy” — many other times over the course of several years, each time speaking of His great mercy for all souls. At the direction of her confessor, Faustina documented all of her dialogues with Christ in what she called her “Diary: Divine Mercy in My Soul” (which received ecclesiastical approval from the Congregation for the Doctrine of the Faith in 1979). Within these pages we read the repeated and urgent plea of Our Lord’s love and the purpose of His conversations with Faustina: “My Heart overflows with great mercy for souls. … If only they could understand that I am the best of Fathers to them and that it is for them that the Blood and Water flowed from My Heart as from a fount overflowing with mercy” (Diary, p. 165). Sister Faustina’s encounters with Jesus are considered private revelation — that is, a revelation outside of the deposit of faith, and one which the faithful are not obligated to believe. However, these mes-sages have been officially approved by the Church as containing nothing contrary to faith or morals. It is important to understand that this is not a new feast day in the Church. As explained in the congregation’s document, Divine Mercy Sunday gives an additional name — a new “appellation” — to the day that is already a solemnity of the liturgical year — that is, the Second Sunday of Easter. With regards to that day’s liturgy, nothing is to be changed in either the texts of the Divine Office or the Missal. In fact, the previously established liturgical readings for the day fit in perfectly with the theme of mercy. In the Gospel, the Lord imparts to the apostles His authority to bind and release the sins of men, thereby instituting the Sacrament of Penance. The feast of Divine Mercy, then, is a continuation of the celebration of Easter; it is, as Pope John Paul once said, Christ’s “Easter gift” to the world. The feast of Divine Mercy is not only a beautiful reminder of the love of God, but also a challenge to a deeper understanding of who He is, and who we are in relation to Him. St. Faustina recognized this truth and responded in her weakness to the power of Christ’s mercy. First, on the crucifix, one Our Father, Hail Mary and the Apostles’ Creed.